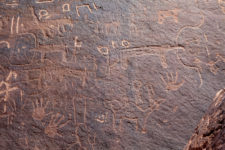 Qaryat al Asba, known to the West as Graffiti Rocks, is about 140 km west of Riyadh, near the highway exit for Musayqirah. Geologically, the formation is an inselberg (isolated outcrop), prominent in the open plain surrounding it. 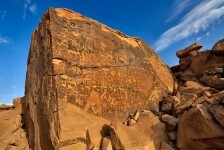 To the east is a north-south trending ridge that apparently has less significant images carved into the rock. Images of individual figures are sprinkled all around the outcrop, but the largest and most impressive petroglyph panel is on the northwest. It is packed with hundreds of small figures, mostly dating to the later period. These include numerous species of wild animals, including ostriches, as well as camels, battle scenes with cavalry and infantry, date palms and writing. On the eastern side of the rock, near the top, is what appears to be a Neolithic scene. 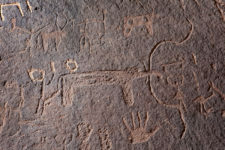 It depicts the extinct aurochs (wild cattle), as well as humans and “handprints.” Despite the proximity of Qaryat al Asba to Riyadh, the Neolithic panel there has not previously been described. This expands the geographic range of Neolithic petroglyphs into Central Saudi Arabia, much farther east than previously known. The site’s proximity to Riyadh and accessibility makes it particularly susceptible to vandalism and over-writing by modern graffiti.